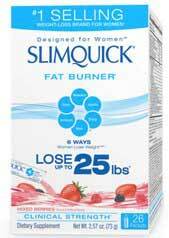 According to SlimQuick’s official sales page their product is fast-working and has been formulated to overcome the six psychological barriers women face when trying to lose weight. The nature of these barriers is never elaborated on though, nor is there any explanation as to why these barriers should be any different to those faced by male dieters. Fat Burner does have the advantage of being an easy supplement to get hold of though. Most Canadian customers will need look no further than the nearest Walmart, but many other retailers also stock SlimQuick products and several online purchasing options are also available. The recommended retail price is just under $30, and some outlets sell Fat Burner for around half this price, so not only is it a readily available product, it can also be quite reasonably priced, but no money back guarantee is offered and there are many things about this product that suggest cautious buying. What is SlimQuick Fat Burner and How Does it Work? 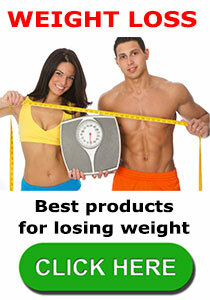 SlimQuick Fat Burner is a diet pill. The manufacturers prefer to call it a “caplet”, but what’s in a name? The first dose should be taken with 8 oz. of water, at breakfast. The second dose is taken six hours later and Fat Burner is slightly different to the other products in the SlimQuick range because a dosing chart is provided, and the dose increases over a three week period. Week 1: 1 pill, taken twice a day. Weed 2: 2 pills, taken twice a day. Week 3: 3 pills, taken twice a day. As with the majority of diet products, Fat Burner has been designed to be used alongside an overall weight management system that includes a calorie reduced diet and regular exercise. Like many of their products, SlimQuick’s Fat Burner contains an above average amount of ingredients, most of which form a proprietary blend (738 mg). The use of such a blend is not uncommon, but it makes it very hard to judge a product’s pros and cons because the inclusion rates in proprietary blends are seldom stated. It is also interesting to note that their chosen blend, called “SlimQuick 6 Ways Complex” is also used for their Extra Strength product, but comparing the two lists of ingredients reveals several discrepancies. The 6 Ways Complex in SlimQuick Extra Strength shows Black Pepper Extract, Pomegranate, and capsicum Extract. Fat Burner does not contain any of these ingredients, so it would seem that their 6 Ways Complex varies from product to product, and his does not instill much faith in the manufacturer, their blends, or their products. Green tea is often found in dietary supplements, but its fat-busting powers are far from proven. Capsicum, on the other hand, has been proven to assist fat metabolism, as has a component found in black pepper, but although these are purported to be included in the 6 Ways Complex—as used in Extra Strength—their absence here results in a poor-looking lineup. 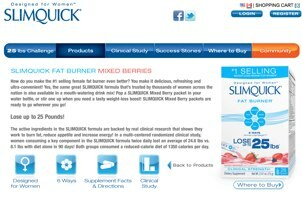 SlimQuick Fat Burner has never been tested and it may not work, but visitors to the SlimQuick website’s “Clinical Study” page can be forgiven if they fail to realize this because the page is very misleading. A graph appears to show effective SlimQuick results, as does a doctor’s statement, but the statement and the graph both refer to an unknown ingredient that SlimQuick claim to use in their product (which product, or products, is not stated). The testimonials shown on the SlimQuick website paint a glowing picture, but fail to mention which product they refer to, and closer inspection of some of the smaller print reveals that some dieters were “remunerated” for their endorsements. Independent feedback indicates the use of these pills may cause side effects, so pregnant and nursing mothers are advised against using this product. All other potential users are urged to seem medical advice before use. Despite the many misleading claims made for SlimQuick Fat Burner, there is no proof that it works. The list of ingredients is not particularly impressive and the 6 Ways Compound, that makes up the majority of the blend, is a very questionable addition because SlimQuick appear to change the constituent parts for different products in their range. SlimQuick make many promises for their fat burner, but provide no real evidence to back them up. Talk is cheap, and although the manufactures can talk the talk, customer feedback indicates their product fails to walk the walk, so consumers are advised to look elsewhere. If you are wanting to use a fat burner then PhenQ gets out highest recommendation. 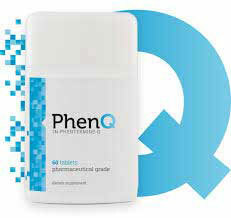 PhenQ has been the highest rated fat burner on numerous weight loss related organisation for last few years. It is made with premium ingredients that are hybrid from the natural and pharmaceutical world. This entry was posted in Fat Burners and tagged Fat Burner Mixed Berries, SlimQuick Fat Burner, Slimquick Target, SlimQuick Walmart by admin. Bookmark the permalink.